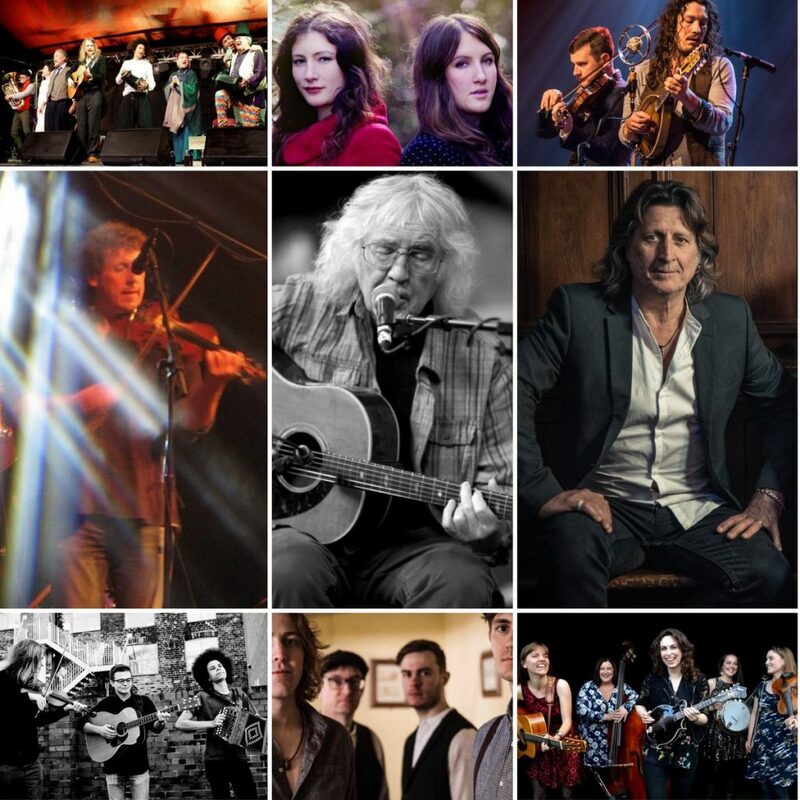 Cornwall Folk Festival brings top local, regional, national and international artists to the North Cornwall town of Wadebridge each August Bank Holiday weekend. We are a town-based festival, started in 1973 and now in our 47th year. Wadebridge is a small town, and we use its existing spaces and venues, all of which are within easy walking distance. From around midday on the Saturday to Monday, we run the outside FAR Stage (behind Wadebridge Wines in Eddystone Road, PL27 7AL); nine varied acts each day from Cornwall and the South-West, with music from the traditional to alt-folk and beyond. There’s food, and we run a bar featuring local beers, ciders and gin, plus wines and soft drinks. This space can accommodate around 300 people, and entry is £5 per day per person, or £8 for families. From Thursday to Monday evening, we hold a main concert in the Town Hall, The Platt, PL27 7AQ. Most nights there are two acts, though we have three on Monday. Again, we run a bar featuring local suppliers, plus wines, but no food. These gigs are usually seated, and the seated capacity is 230 people. On the Monday night we will probably take away some of the chairs to create a dancing space as well. Tickets are £17.50, or £25 for Steve Knightley (Thurs 22nd) and The Unthanks (Sat 24th). Half price for under 16s; free for under 5s. This year we add a new venue 100-seat for two evening gigs on Friday and Sunday: the Betjeman Sessions at the Betjeman Centre, Southern Way, PL27 7BX, each concert featuring two artists from the South West, plus one from Kent. £10 each concert; £5 under 16s. From Friday onwards there will be sessions in local pubs and cafes. The Churchill Bars at the top of Molesworth St is our regular venue for evening clubs, and we have recently started a monthly session at the Social Club, Fairpark Rd, PL27 7NT, which we expect will also be a session venue, as well as holding a late-night ceilidh there on the Saturday. Two local pubs have changed hands recently (The Ship and The Swan) and at this stage we are looking forward to getting to know the new management with regards to their being potential session venues. Saturday to Monday noon to 4 there will be live music and dance troupes in Molesworth St and surrounding areas in what we call Shanty Street. And each morning we will run a selection of music and dance workshops. This year on Monday it will include one with Mick Ryan, the creator of the folk opera “Here At The Fair”, on writing and creating such works. Full festival tickets get you access to everything (no accommodation, though). Shortly we will put all the individual concerts online as well. The festival is run by a team of around 12 volunteers and has always been run on a voluntary basis. We have been incorporated as a Community Interest Company since 2015 (Company Number 09516248). We rely on the support of many local people, organisations and businesses, and budget to make a small surplus each year to ensure the longevity of the festival, to continue its contribution to the North Cornwall economy, and most importantly. to provide a place in Cornwall for people to enjoy great folk music of all kinds, to support the careers of musicians, and as a platform for aspiring performers and local and regional talent. We also think we put on a very good festival! Hope you enjoy CFF 2019, and look forward to meeting you all!